Files located on a CAE account can be accessed remotely through the site https://myfiles.cae.wisc.edu . When accessing this site, you will be prompted with a login box. Please use your CAE username and password. You can also access this webpage through your My CAE Account page. 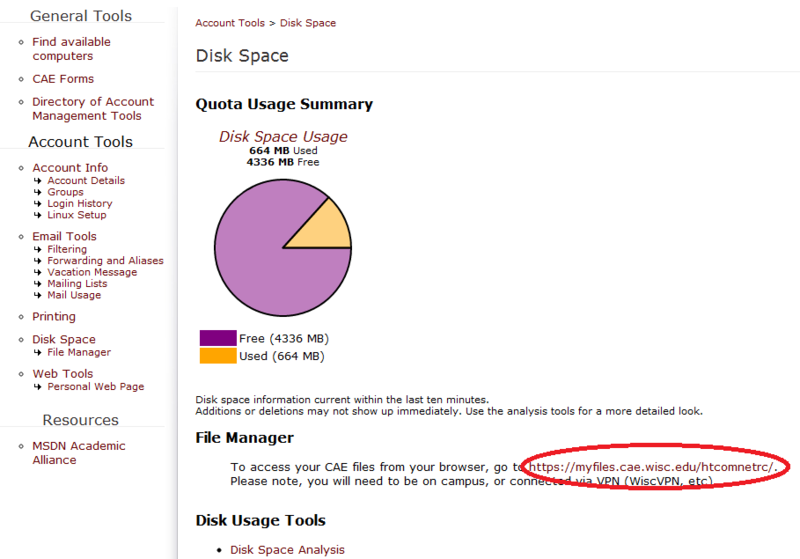 Navigate to my.cae.wisc.edu, login using your CAE username and password, and click the "Disk Space" button. The link is located on this page, as seen below. To download a file, simply right click on the file, and select Download. To upload a file, select the upload button located at the top of the page. Then select the file to be uploaded by clicking the "..." button. Complete the process by pressing the "upload" button. To move a file, right click on the file and select "cut". Then navigate to the desired folder, right click near the green arrow in the folder, and select paste. To access a folder, double click it in either the left or right pane. To go up a folder level, double click the green "up" arrow at the top of the page.